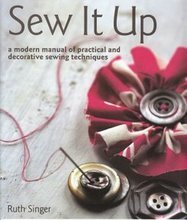 This is Ruth’s first book, published in 2008 and covers pretty much everything a beginner or intermediate stitcher needs to know, from inserting zips to creating decorative edging. This book is aimed at dressmakers and includes a few advanced techniques like couture hems along with all the basics on construction, although not tailoring techniques such as pockets or plackets. There is also a large section on decorative techniques including fabric manipulation, decorative pleating and much more. 20 projects give you opportunities to practice the techniques and there is a strong emphasis on recycling and making do. Please note this book is the same as The Sewing Bible, which is the American edition with the same content but Imperial measurements. I love this book. It has become my sewing bible. I use it al the time to learn new techniques and to remind myself how to do tasks. It is really easy to understand with clear diagrams taking you through step by step. It covers everything from what needle, what fabric to use for what and all the key sewing techniques. I am so pleased I bought this book. I have gained confidence as a beginner and now complete more intermediate projects. I you can only afford to buy one sewing book then this is the book to buy. I’m so glad you find it useful and thank you for sharing your review!